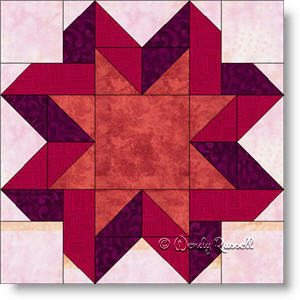 The Ribbon Star quilt block is a nine patch block that is a good choice if you want to make larger blocks and therefore, less blocks. A win-win situation. However, I have also included instructions for a smaller block as well. The Ribbon Star block is designed to give the illusion of a ribbon weaving around the star, showing both the top side of the "ribbon" as well as the underside. The two sample quilts illustrated are both on point settings but give totally different looks to the final product. Colour placement is key to a unique design.